Creative people are complex and multitalented. Along with the benefits of many abilities and passions, there are challenges in realizing so many interests. “Now if you had to guess, how old would you say you were when you were first asked this question? You can just hold up fingers. Three. Five. Three. Five. Five. 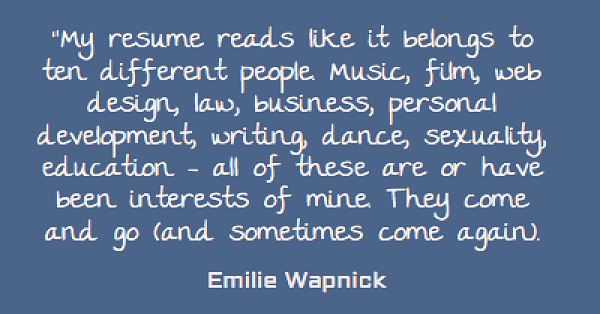 Text is from transcript of her TED Talk: Emilie Wapnick: Why some of us don’t have one true calling. book: How to Be Everything: A Guide for Those Who (Still) Don’t Know What They Want to Be When They Grow Up by Emilie Wapnick. What do you want to be when you grow up? It’s a familiar question we’re all asked as kids. While seemingly harmless, the question has unintended consequences. It can make you feel like you need to choose one job, one passion, one thing to be about. Your endless curiosity doesn’t mean you are broken or flaky. What you are is a multipotentialite: someone with many interests and creative pursuits. And that is actually your biggest strength. How to Be Everything helps you channel your diverse passions and skills to work for you. Based on her popular TED talk, “Why some of us don’t have one true calling”, Emilie Wapnick flips the script on conventional career advice. Instead of suggesting that you specialize, choose a niche or accumulate 10,000 hours of practice in a single area, Wapnick provides a practical framework for building a sustainable life around ALL of your passions. • Why your multipotentiality is your biggest strength, especially in today’s uncertain job market. • How to make a living and structure your work if you have many skills and interests. • How to focus on multiple projects and make progress on all of them. • How to handle common insecurities such as the fear of not being the best, the guilt associated with losing interest in something you used to love and the challenge of explaining “what you do” to others. Not fitting neatly into a box can be a beautiful thing. 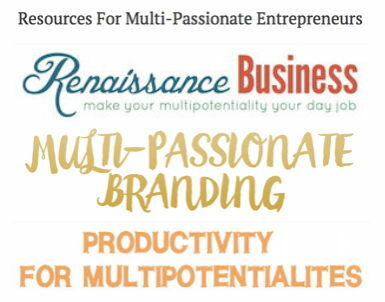 See information below about her Renaissance Business program for multipotentialite entrepreneurs. From my article The Complex Personality of Creative People. Can multitalented people choose whatever path they want? One of the myths of high ability, multitalented people is they can choose whatever personal and career paths they want, and realize their abilities without hindrance. From my article Multipotentiality: multiple talents, multiple challenges. 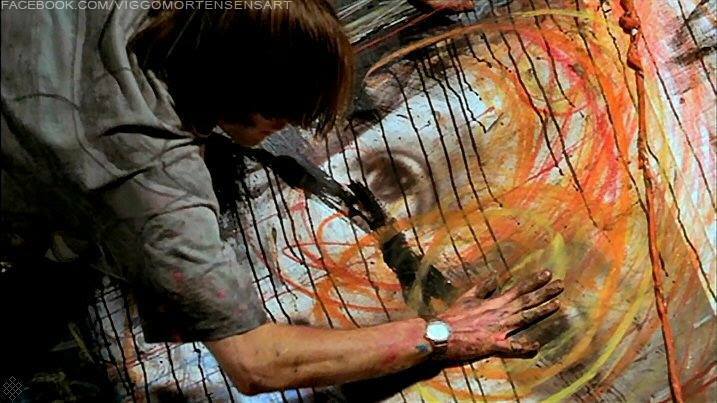 “The difficulty for me is that I’m interested in so many different things. “I could never really imagine myself doing one thing, and I’m pretty sure that I’ll end up doing four or five different things. “I want to be a Renaissance woman. Her audio clip in my video is from the video: 10 Questions for Harry Potter’s Emma Watson. 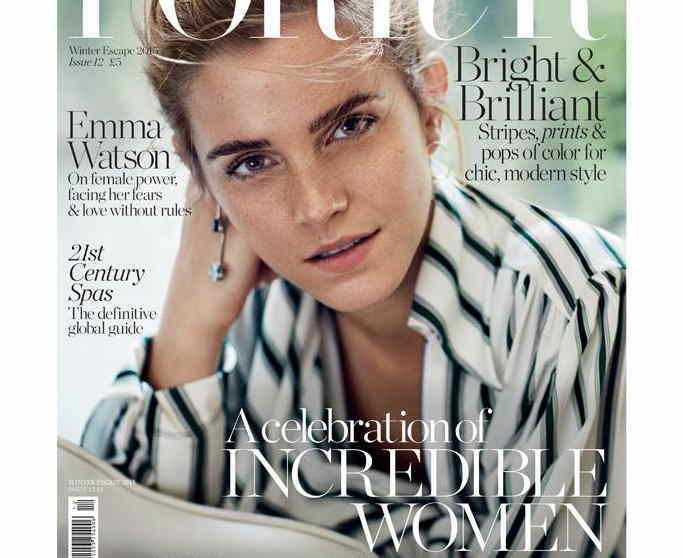 Related article with her quotes: 10 Questions for Emma Watson by TimeMagazine, Nov. 29, 2010. 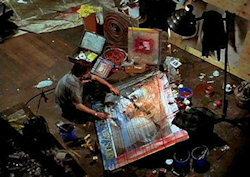 “Viggo Mortensen working in his artist loft on the set of A Perfect Murder (1998). 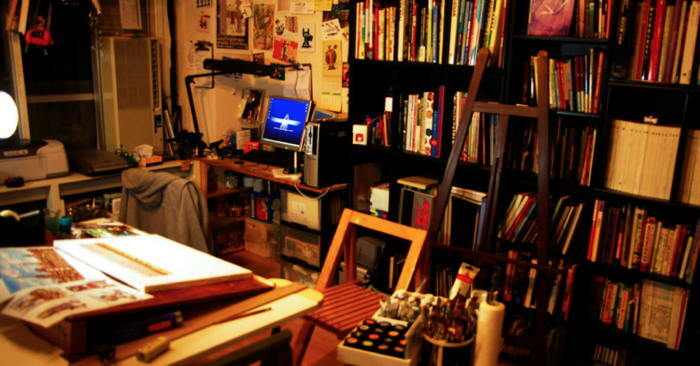 “Mortensen surprised the art director and crew when they were wondering where to get avant-garde art for David’s loft, when he hauled in several of his own works. His related audio comments in my video are from a video interview: “10 Questions for Viggo Mortensen” by TimeMagazine, Dec. 17, 2008. In my video, Barbara Sher comments: “One problem I run into with a lot of Scanners is perfectionism, which means ‘I want to do something so well that nobody will criticize me.’ That’s all it means. The audio clip is from video: Refuse to Choose: Scanners Must Use All Their Gifts. Making Dreams Happen Audio Program with Barbara Sher, Barbara Winter, Valerie Young and other successful entrepreneurs – “Whether you dream of starting your own import-export business… writing a best-selling novel… owning a dude ranch… working with kids… helping underprivileged families… whatever your passion… deep inside you know what you really love to do, the life you dream of having. Book: Refuse to Choose! : A Revolutionary Program for Doing Everything That You Love by Barbara Sher. The abstract animation at beginning of my video (at the top) I created online at Silk – Interactive Generative Art. 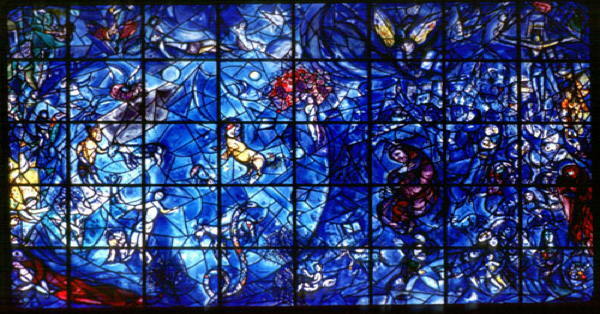 Marc Chagall stained glass window at the United Nations building. “Would I have to settle on a ‘practical job’ and pursue my various passions on the side or choose among my interests and just commit to one thing? 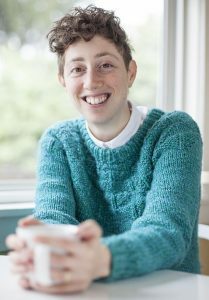 Emilie Wapnick – from my post: Resources For Multi-Passionate Entrepreneurs. “Imagine having a business that allows you to focus on many of your interests and use all of your skills on a regular basis. What is a Multipotentialite? Emilie Wapnick explains. Related identities include: Polymath; Renaissance Person; Scanner and others. 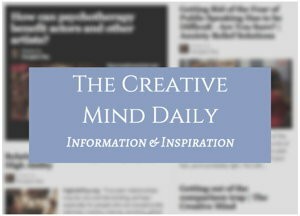 See more Multipotentiality Resources on my High Ability site – Articles/posts, books, sites. 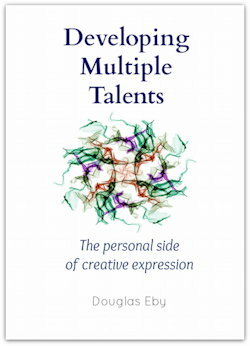 Developing Multiple Talents: The personal side of creative expression. – Stephanie S. Tolan, writer and consultant on the gifted. For more reviews etc see the page About the book. One way to keep exploring and expanding your talents and interests is to take online courses. Another popular site for online courses is CreativeLive – it features 1,500+ classes (free and paid) in photography, video, design, business, audio, music, crafting, software training and more.